Avoid, Deny & Ignore are 3 actions that are prevalent in our modern society. This is the second of a three part series. All three of these verbs are similar but yet very different. We will be looking at both the good and the bad of each word and we will be learning what the Bible has to say about these verbs. 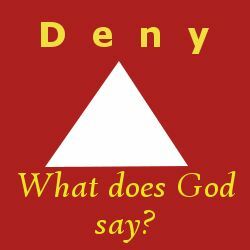 Today we will focus on the word "Deny"
Definition: to declare untrue, to refuse to grant, to refuse to accept the existence, truth or validity of, to restrain from gratification of desires, to disclaim connection with or responsibility for. As I see it there are 2 major areas of denial - the positive & the negative. The negative is of course denial of the truth and the positive is denial of self to benefit others (and to benefit ourselves). Negative - Let us first talk about the worst kind of denial: denying the existence of God. Let us look at what the Bible has to say about these three and what happens to us when we deny Jesus. This sends horrifying chills down my spine: "The Lord turned and looked straight at Peter." How Peter's triple denial must have pained Jesus but look at the consequence of denying Jesus "and he (Peter) went outside and wept bitterly." I looked up the meaning of "bitter"- "resulting from or expressive of severe grief, anguish or disappointment" and "difficult or distasteful to accept or bear." What a heart wrenching scene - I get a lump in my throat every time I read this passage. Then, as we see in the passage below - we must acknowledge both The Father and The Son - we cannot have one without the other. These verses are very clear and honest - the man who denies that Jesus is the Christ is a liar & the antichrist!! We also need to talk about false prophets - people whose actions purposely distort God's truth. This line below is scary but unfortunately relevant to some people today: they"change the grace of our God into a license for immortality & deny Jesus Christ our only Sovereign & Lord." What will happen to these deceivers? - "condemnation!" Test people's actions with the Word of God - if it doesn't match up then that person/those people might be false prophets --- Have nothing to do with them! The verse above might not be exactly what I was thinking about (although it's interesting that the word "bitter" was used again). I'm thinking of the kind of person that seems to "talk the talk & walk the walk" but occasionally you might notice a glimpse of what's truly inside - an attitude that shows their true motives. This is someone who way down deep denies Jesus & is just going through the motions "just in case it's true." I can never prove this - but God knows!! You can never hide anything from God - not even your motives or your thoughts! Positive - this is the type of denial that benefits ourselves & others. This is the kind of positive denial that I am talking about - giving up our earthly desires to focus on living for Jesus and following His example. In the verses above you will notice that this is a daily denial of self. Everyday will bring new difficulties or new temptations and everyday we must make that decision: "follow the world" or "follow Jesus." Over time you will change (for the better) and you will develop new positive habits that will benefit others & yourself. The line "but whoever loses his life for me (Jesus) will save it" means that you will have eternal life if you follow Jesus - you are saved by the blood of Christ! My generation is "Generation X" (Gen X) and many of us are just now starting to deal with our parents becoming elderly and in need of help. I am speaking from personal experience - there will come a time when you will have to admit that your parents are not invincible and there will come a time when they will need your help. You might need to give up your own house and deny your personal comfort and go live in your parents home to take care of them. Or, you might have to admit that their illness is too much for you to handle & then have to make that difficult decision to put them into a nursing home. These are some of the most difficult types of "denial" but they will benefit others (your family) and yourself in the end. The verse above isn't just talking about taking care of our parents - it could be a pregnant teenage daughter or niece - or it could be a brother who has lost his home to foreclosure. If you do not help and provide for your family in anyway possible then you have "denied the faith" and you are "worse than an unbeliever!" I'm going to give you 2 examples of what I call "The Downward Denial Spiral." 1. Let's say that there is a husband who has a drinking problem ----> He starts out only having a few beers on the weekend -----> Then it is just a few everyday after work ----> Then it is a six pack a day ----> Then occasionally he starts out his morning with a few before work ----> When confronted by his wife he denies it and twists the truth by saying "it's a difficult time for me right now" ----> He continues down this Denial Spiral until disaster strikes when he kills a woman in an oncoming car while he was driving drunk. 2. Now we are talking about a single woman who loves to shop ----> She has a budget and splurges on something special for herself once a month -----> One of her co-workers just bought the coolest and newest pair of designer jeans that she must buy for herself (even though it's not in the budget) ----> She decides to skip paying the electric bill at her apartment for just this month, after all they have to allow a "grace" period ----> Then she attends a huge sale going on at her favorite designer clothing store ----> She again doesn't have enough money for that electric bill the next month----> Now she is receiving threatening letters from the Utilities Company ---> When confronted by her father she lies and says that she is still under that "grace" period ----> She continues down this Denial Spiral until the electricity in her apartment is turned off. The only thing that could have changed this "Downward Denial Spiral" was if that single woman had admitted that she had a problem and then finally seek help. These are (of course) extreme examples but the "Downward Denial Spiral" can come in many different forms. The only way to resolve that horrible trap is to admit, acknowledge and confess that there is a problem. Then and only then will you be able to fix that problem and stop or prevent that downward spiral.